Check it out! It’s all blocked and I’m putting it together now. It’s practically a sweater! I keep making Jon try it on when a new seam is finished. He’s getting mildly annoyed and statically charged, but it looks really good on him. I’m worried that the arm holes might be a bit high and small, but he swears they feel fine. I guess that response is the knitting equivalent to the one for “Do I look fat?” I’m not picky, I’ll take it. So yesterday, my friend Charlene paid us a visit and left a comment among the ones she received. A very nice introduction, I’d say. La asked if this meant she had to stop swearing. The answer to that is a resounding “Heck no!” Charlene is as salty as any pirate I know and especially favors the term “jackass” lately. I’m partial to pairing body parts and diseases for maximum effect. Some folks asked when Charlene was going to start knitting and I just don’t know if it’s ever going to happen. 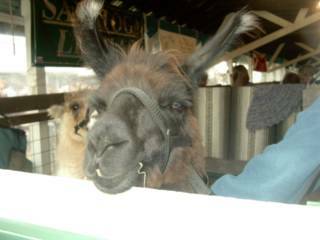 But she does wear scarves well and appreciates llamas and alpaca like no one else. She went to Peru a couple of summers ago and brought back a bunch of great knitted stuff. She suggested that we make a return trip figuring it would make great blog fodder. I wholeheartedly agree. 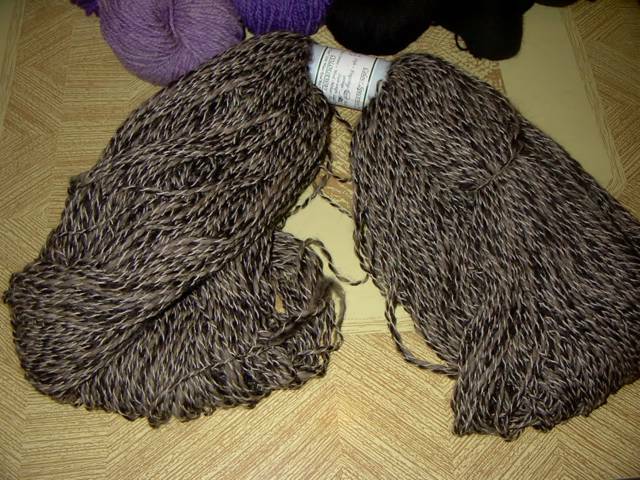 Wouldn’t you all like to see pictures of me pillaging a small Peruvian village and absconding with all of their yarn? I knew you would. One more thing about Charlene, she was there for the 28-foot-blanket incident. 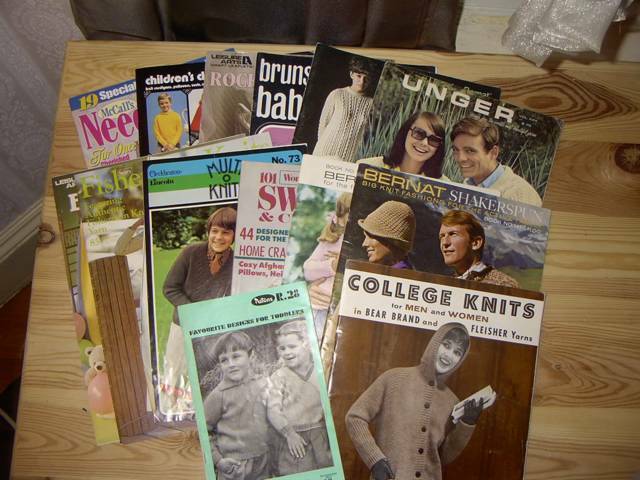 The other day, I told my dad I was going to make him a sweater and had him look at some patterns. I originally showed him this one, but he said it was too pƒ©pƒ© (a French term for grandfather). He looked through a bunch of other 60’s pattern books and it was hilarious. He LOVED them and was pointing out all the sweaters he used to have. 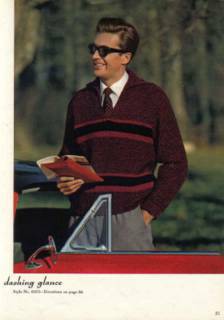 He’d point to one and describe it, nudging my mother and saying “Remember that sweater? Mine was yellow!” and was describing others as “really sharp” saying “they just don’t make them like this any more”. My mom joined in when she saw some gorgeous knitted coats, which she had made for herself. I knew my mom used to knit beautiful things, but I never realized my dad had such a soft spot for knitwear, then he reminded me why. Many years ago, he and my mom used to work at a sweater factory in New Hampshire, which was once renowned for its textile mills along the Merrimack River. I think they actually met there. It was called Pandora* He got this sort of animated air about him and said “You should get a knitting machine! Then you could get tons done really fast!” and proceeded to demonstrate how a knitting machine works using his hands and sound effects. In case you were wondering, the sound of a knitting machine in action is “tktktktktktktktktktktkt” and the sound of an entire sweater being whipped out by one is “zooooooooOOOOOOOOP”. Then he told us about the difference between “Cut and Sew” sweaters and “Full Fashion” ones. As you can imagine, “Full Fashion” is the good stuff that took a lot of detailed hand work. 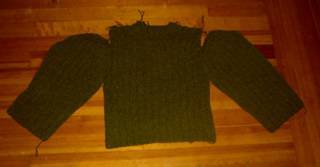 “Cut and Sew” was a giant piece of knitted fabric that was then cut into pattern pieces and sewn together. My mom worked on Full Fashion doing something called “looping”. I’m not really sure what that is (I think it had to do with attaching sleeves), but she still remembered the hand movements she used on her machine. I wish I could fully explain how great it was to have my dad imitating a knitting machine and my mom doing “looping” in the air. Truly a sight to behold. Apparently it’s in my blood. 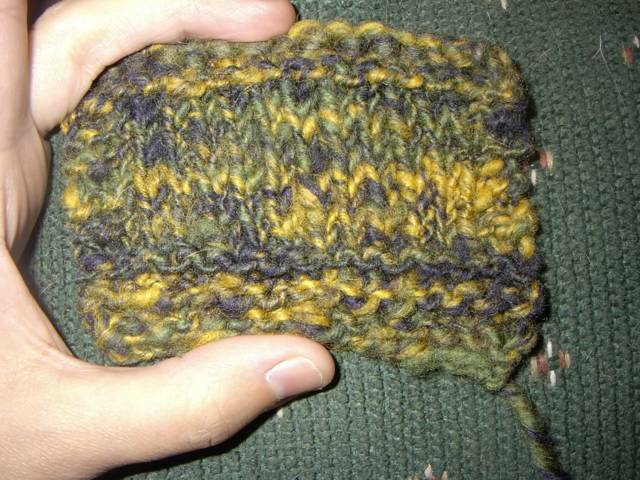 Anyway, this is the pattern my dad finally picked. I asked what color he wanted and he insisted that it be red. Turns out he just loves red, but never wears it (I think my mom has something to do with that). 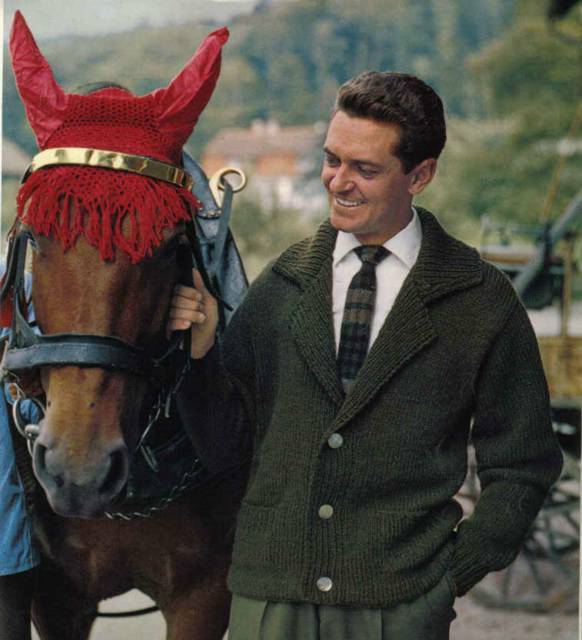 So a dashing red sweater it is. Here is where I will need to do some searching. 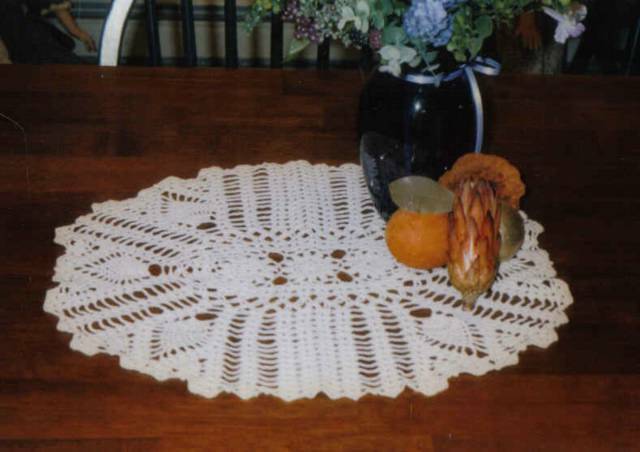 The pattern uses Spinnerin yarn which, of course, no longer exists. It uses needles 5 and 8, the gauge is 5 sts = 1 inch and 7 sts = 1 inch. I can only assume that the #8 needles yield the 5st/1inch gauge. 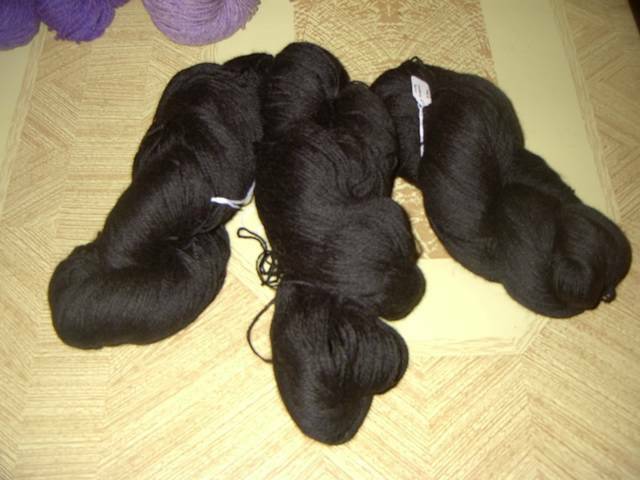 Would anyone in the blogsphere know of a yarn that has the gauge and would produce this red/black color mix? What is that called when the colors are mixed up like that? I may have to make a trip to Webs for this one. Oh Meeeeelaniiiieee . . .
Also, as a side note, I added some more stuff to my finished object list. They’ve been finished for a while, I just got around to getting pictures now. 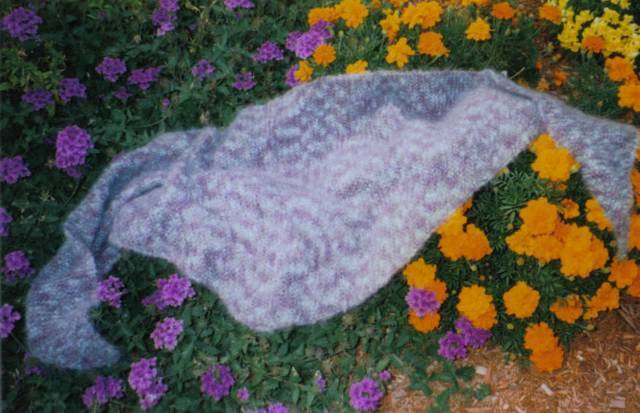 I’ve got a shawl, a cat blanket, a doily, and a felted bag. All of these were for my mom. I’m going to make her a felted hat to go with her bag next (by her request). She uses the bag all the time and really enjoys the attention it gets. She loves the eyelash yarn and I’m hoping to get her back into knitting by buying her some cool, crazy stuff. She really is a talented knitter/crocheter/embroiderer/seamstress/lady. *If you’re intersted in the mills, this site has gorgeous photos, click them to see the high quality images. It’s funny, I was just looking for a good picture of the mills, and for almost an hour I’ve been poring through a bunch of sites about them. They really give me a sense of “home” and I think they’re so beautiful. After almost 20 years away, I’m only recently appreciating how rich in history my hometown is. Oh my goodness! It’s a mess in here! I need to clean up. We’re having very special company today. Today I told my best girlfriend, Charlene, about this blog. I’ve been keeping it on the QT for a while because I was afraid she would think I was a dork writing a whole blog about knitting (she’s not a knitter), but I couldn’t stand it any more and invited her to pop in and have some coffee. Everyone be on your best behavior. Hi Charlene! -waving madly at her sistergirlfriend- Welcome! The Red Sox ain’t got nuthin’ on me, baby! They may have red socks, but I’m going to have a black tank, a tan sweater, a blue hoodie, a green felted bag, and an assortment of buttery soft scarves! Melanie (who has also documented our lovely day she’s got foliage pictures and everything!) 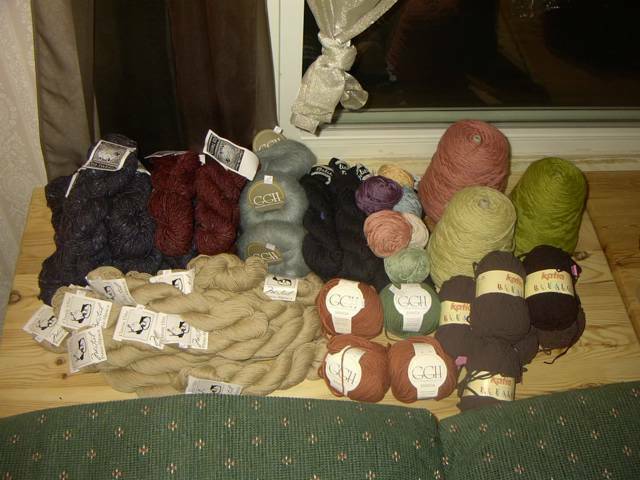 and I trekked out to the scenic hills of Harvard, MA to attend the Fiber Loft’s 30th anniversary sale. Happy Anniversary, indeed! We made sure to meet up early so we could get prime pickins. I printed out the wrong map, so we had to ask for directions once we got to Harvard. I’m constantly getting lost, so this is Standard Operating Procedure for me. I pulled into a gas station where a cute mechanic asked where I was headed. I mentioned the street and that it was a yarn store. My jaw almost hit the floor when he not only told me where the street was but what the actually yarn store looked like and how many doors away from the stop sign it was. Granted, there was only one main street in town, but I prefer to think that his house is full to the brim with yarn. Picturing those oil-stained fingers around a pair of knitting needles made me smile, so I’m just going to go with it. As luck would have it, we got there shortly after they opened and before it was too crazy, so we had a great selection to choose from. Much to our delight, there was an upstairs. Our eyes lit up at the very mention of it. 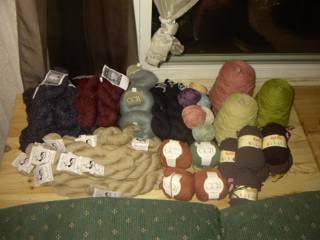 I almost missed an entire room of stuff, but in true knitting buddy fashion, Melanie brought it to my already over stimulated attention. Between the two of us, we emptied a few boxes for them. You know, as an anniversary gift. It was a great time and here is what I hauled home in a big, clear plastic bag. – Classic Elite 03 Tweed, mostly in blue but a couple of skeins of burgundy in case I’m in need of a stripe. I think I’m going to use it for the hoodie in SnB (I need to check the gauge). – Classic Elite Pima cotton/Alpaca blend in tan. It will some day be a very soft sweater. – Classic Elite Believe, which is a lumpy black cotton with little bits of shiny rayon here and there. This is going to be a tank top. – GGH Samoa in a sort of burnt umber and green. There’s not much, so scarf it is. 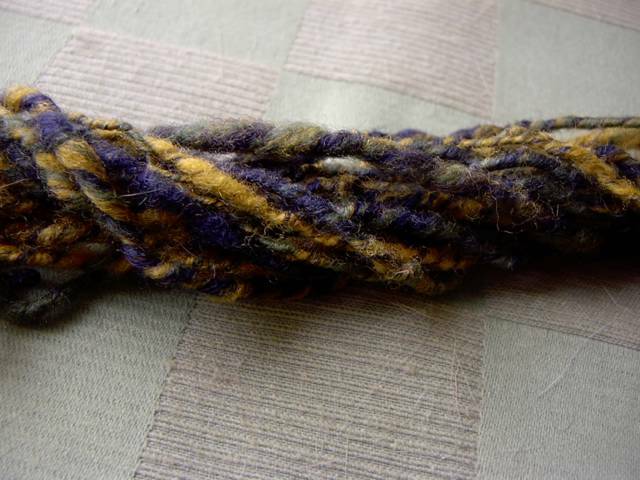 – Peruvian Wool cones, which will probably end up as a felted something. – Katia Buffalo in dark brown and black. This is a cool poly material that is sort of polar-fleecy/suedey. This is earmarked for Jon’s winter scarf. – Assorted cotton in assorted colors. I found a bag of possible leftovers, but the colors are so pretty. 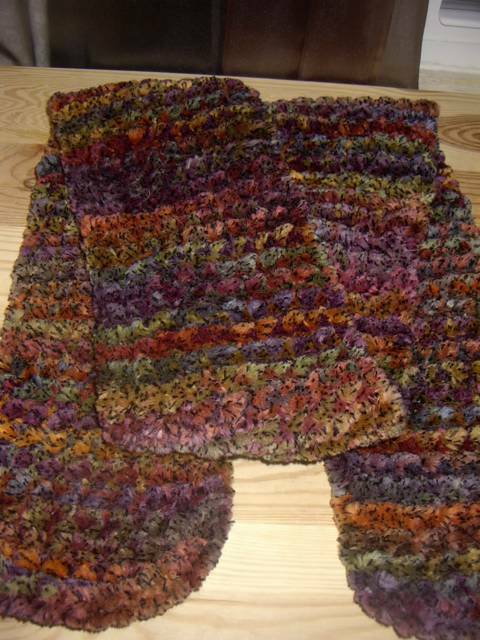 My mom has already deemed that these become a spring scarf for her. Here’s a close-up of the Soft Kid. They had some purple and light blue. Now I wish I had snapped it up. And here is a scarf that I made out of some non-sale yarn I got. It’s Online Linie something-or-other. I lost the label. It’s amazingly soft, like I skinned a bunch of stuffed animals (good ones, like Gund. Not some cheesy carnival ones). After shopping, Melanie and I found a little cemetery where we parked our behinds on some rocks and knit for a spell. 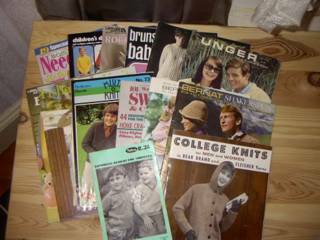 She also gave me another bunch of vintage mags from her mother-in-law! There’s an 80’s one in there that was actually painful to look at. We’ll be seeing more of these in weeks to come. And I gave her the Oopmah Loompahs, which turned out to be some alpaca from A Touch of Twist. 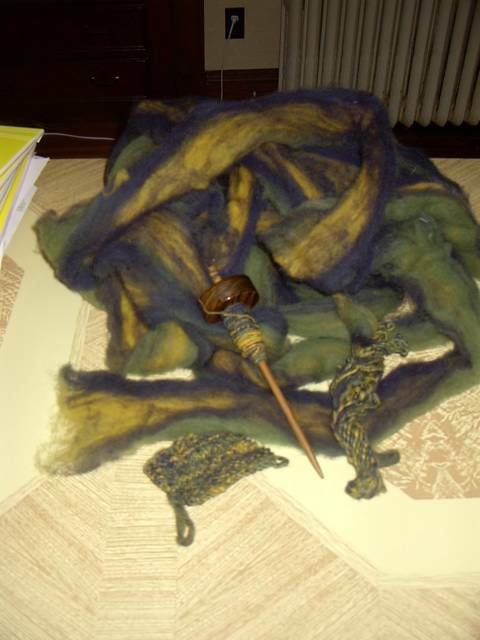 It’s the same color as I got – “Middle Earth”. See the Rhinebeck post for a picture. Once we got cold, we headed off for lunch. Now, when I think of a quaint New England town, I think of little cafes and coffee shops. Apparently I need to rethink my position. We drove around for almost an hour looking for a place to eat. I figured if we just drove in concentric circles, we’d eventually find something. This is also SOP for me, and luckily, Melanie actually likes driving around aimlessly. This is a good thing when you’re in my passenger seat. Finally we found a little Mexican place that was pretty good. It was a good end to a really nice day. Pumpkin muffins, yarn, magazines, burritos . . . what more could you ask for? From the comments section of the previous post, it looks as though Jon’s Yarn Widower booth at Rhinebeck next year would be crammed full of our disinterested Others. He decided he wanted a dart board in there, too. I think it would be good of there was a skein of yarn attached to the center to give them something they hated to aim at. Sometimes he looks at my knitting bag with such despair. Last night I was working on the second sleeve of his sweater and he was lolling around his side of the sofa, poking me with his feet and looking coy, almost coquettish. I finally said ¢â‚¬ËœWhat?! Is there something I can do for you? Something you need?” and he said “Acknowledge meeeeee!” Instantly, I felt guilty. 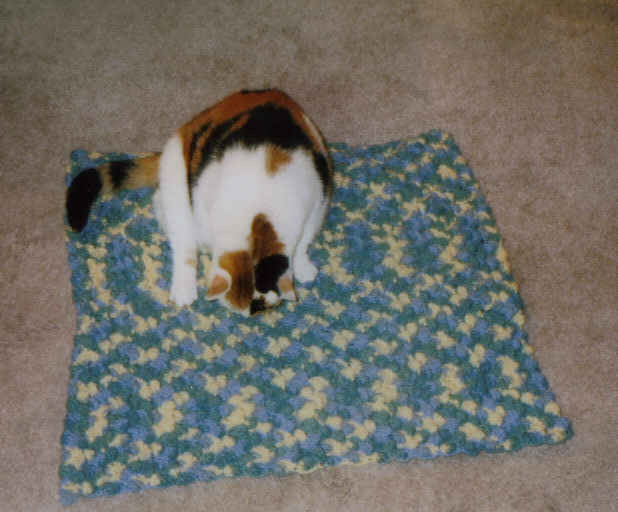 Was my knitting getting in the way of our relationship? Was I purling a rift between us? Would I long for these lost moments with him on my death bed? I turned to him my husband, my beloved partner with whom I share me very soul and said “You exist, I see you.” and went back to the task at hand. Sleeves don’t knit themselves, you know. 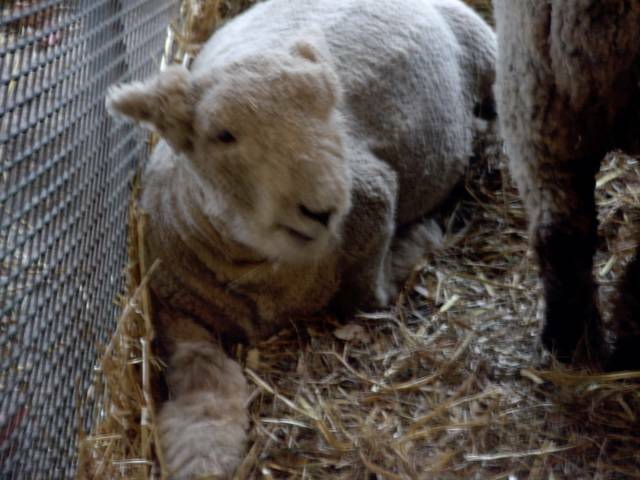 OK, I’ve been back from Rhinebeck for a couple of days, I didn’t just set up residence in one of the empty sheep stalls (but don’t think I wasn’t already making a nest when they caught me). I brought home so many new distractions, I could barely peel myself off the couch to practice simple personal hygiene, so the blog got a little neglected. But now I’m ready to share my haul with you. Well, you can look at it. No touching. I may bite. We went on Sunday and the weather was just beautiful. The night before, we had a great dinner with my cousin Elaine, her husband Bob, and a couple of their friends. One friend was a lovely woman, very serene and kind. Apparently she had raised her kids in a commune in the 60’s and is very liberal and outgoing for her cause, but not all up in your grill. I would describe her as having a cool elegance. The other friend was a man whom my cousin described as an “unrepentant communist”. When I laughed, she said “You think I’m kidding?” His name is Bob and he was all up in your grill. But not in a bad way. He’s probably in his mid 70’s (just a guess, I could be way off in either direction) and he appears to be a bottomless well of lively and entertaining conversation. And he is indeed the most left wing person I’ve ever met. It was strange coming out of an older gentleman, but also incredibly refreshing. He wanted nothing to do with computers and the internet and all that kerfuffle. As a software programmer, I couldn’t help but be amused and jealous at the same time. Because Jon and I were company and kind of new to the fold, they all put their clothes on when they got out of the hot tub (we didn’t go in). Normally they don’t rush about it. Is my cousin cool or what? Once at the festival, we met up with my mother-in-law, who is sweet and sprightly. She’s just rediscovered knitting and was thrilled to be in the thick of it. Bob and Elaine joined us later in the day and were looking at sheep for the farm they just bought. It’s not ready yet, but when it is, there will be critters. We took a camera, but only took two pictures. Here they are. This is an Olde English Southdown Miniature Babydoll Sheep. I don’t think this was the actual vendor, but it has more pictures of these ridiculously cute things. They’re a lot like Ewoks, except for one major difference – I didn’t want to punch any of the sheep. And this is a llama. I guess he’s cute, too. But you’ve got to try pretty hard after the Babydoll. Better luck next year, buddy. I have to add that Jon (my husband) was very well behaved at this event. He whined minimally and actually showed interest in the spinning wheels. I suspect he wanted to take them apart and leave the bits strewn about the festival grounds. I told him we could try to find the husband pen and I’d drop him off there. Unfortunately, if such a thing existed, they’d want to talk about sports. He was better off with us gals and the pretty yarn. Next year he wants to open a booth for Yarn Widowers that will have a bunch of reclining chairs, Playstations, and a fountain of beer. Alright already!! Get to the good stuff, Yappy McYap-pants! When we arrived, I made a bee-line for A Touch of Twist’s booth. 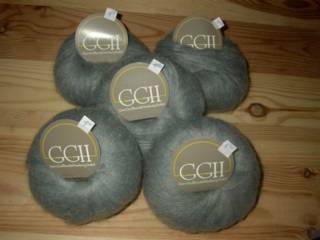 I have a huge crush on their yarn. I placed an order for some Stormy Skies, which they didn’t have on hand. I also got some Middle Earth (I love their color names). I’m perpetually impressed that this is undyed. After that, we wandered and it took me a while to get focused. I got a hold of myself and took a stroll down the Spirit Trail where I happened upon this lovely fluff. It’s Cormo and has been taking up a lot of my time since I’ve been back. 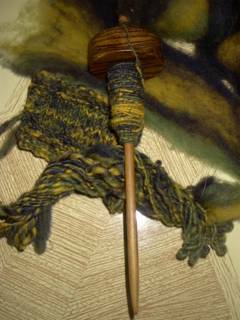 Jen was really nice and directed me to Grafton Fiber’s booth where I purchased a lovely drop spindle (mine is a dark brown hardwood called Bocote). I showed it to my brother, who is a carpenter, and he thought it was gorgeous. I asked how much he would have charged me for it and his answer was “Probably more than $30!”, so I got a good deal. Actually, my mother-in-law got a deal. She bought it for my impending birthday. Yay! AND, Jon actually want to take a crack at it. Yowza! I’ll have him converted to our yarny ways before long. mwaah ha ha ha haaaa . . . I started trying to spin as soon as we got home Sunday night. I think I’m getting the hang of it. Here are some results so far. I also stopped at Delly’s Delights Farm (I love that name!) and got a pound and a half of natural black alpaca. And so begins the Age of Alpaca. 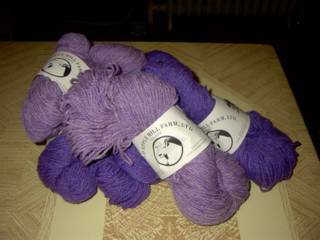 It’s my new favorite yarn and I want to be swathed in it from now on. My brother agreed as he held up the skein Middle Earth to his face (turns out he’s a yarn sniffer, too! Must be genetic.). I offered to make him a scarf with it and he said he didn’t need anything that big. He just wants something big enough for his face so he can feel it all day. As we were leaving, I ran over to Wild Apple Farms to pick up this wool for a great price ($4 each!). 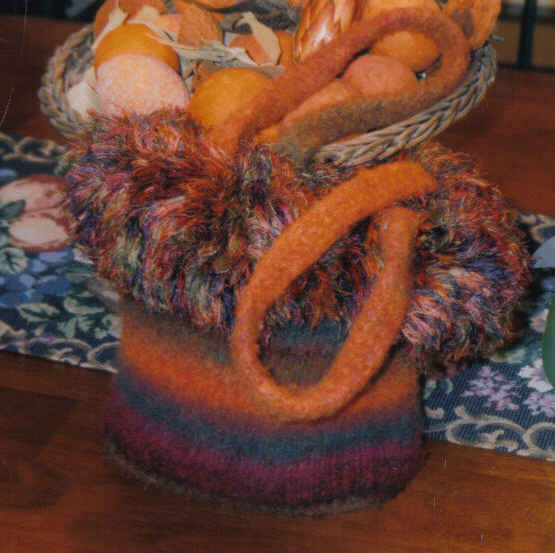 I’m going to make a stripey felted bag for myself with it. I should have gotten more – they had lots of colors and the more you got, the cheaper it was. But I had hit my budget and behaved myself (plus I had no cash left). I got one more thing, but it’s a secret. It’s for Melanie and I don’t want her to see it. But I think she’ll really like it. Can you keep a secret? If I show you, you won’t tell her, will you? Promise? Ok. Here it is. Think she’ll like it? I’m going to see her Saturday, which is good because I don’t have a whole lot of room. I hope she likes it. And that was that. It was a great time and I will definitely go back next year. I was hoping to spot some bloggers, but since I’m terrible with names and faces, I may have been bumping into them all day without realizing it (I probably bumped into you when I was pretending to trip on (to prove a point) one of the gigantic baby Cadillacs people were parking in the middle of the aisles – seriously! Smack dab in the middle!). There should be a blogger sign in book so you know who’s there. 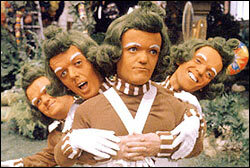 Oh, and because it’s almost Halloween, here’s is a terrifying picture to get the hairs on your neck standing on end. 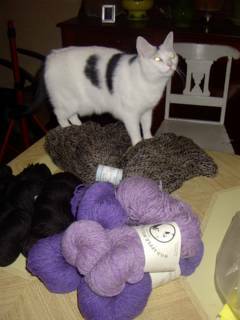 Notice how Dot is summoning all of her supernatural power, causing her eyes to turn to laser beams that will disintegrate anyone who dares get in her way of eating all this delicious yarn? Luckily we had some tuna treats nearby. They are her kryptonite. Man, just seeing her near it is going to keep me awake for days. It’s worse than the end of Blair Witch. Gah.